Whenever you hear Carnival music, it seems to come from distant cities such as Rio de Janeiro or New Orleans, or the most classic such as Venice, Cologne or Nice, or even the nearest such as Santa Cruz de Tenerife, Las Palmas de Gran Canaria or Cadiz. However, people from all over the world are looking forward to go wild and have fun. Just listen! You can already hear the lively music of the brass bands and parades on the streets, the laughter of participants upon hearing the satirical lyrics of street musicians’ songs. You are about to see the joy of authentic parades of color in the form of original costumes that contrast with the sobriety and elegance of traditional masked balls that move to the rhythm of classic tunes. And yes, you can smell the unmistakable aroma of grilled sardines in various places you could not even imagine. Do you want to know where the wildest, less known European Carnivals are happening? Do you want to spend a good time? If you want to have fun in Carnival, (or at any other time, to be honest) you don’t need to go far, you just need to feel like having fun. Despite being a pagan celebration to exalt earthly passions before the period of Lent that leads up to Easter, Carnival is also present in Orthodox countries, such as Greece, where it is being held for more than 160 years in the city of Patras. Of course, the timing is adapted to the Orthodox Lent and does not always coincide with the Catholic one. The Patrino Karnavali, as they call it, is the largest in Europe, although very few have heard about it. Here you will find dance, food, costumes, parades, floats and lots of fun. There are also some activities that make it unique, such as the search for treasure. Their parade is very different from all those held in the world. Here, youth groups, wearing the same costumes, must find a hidden object in the city through questions and riddles about literature, history and mathematics. It’s not easy. Nor should we miss the Bourboulia, where women dress in gowns and cover their faces to make a special dance, Nihterini Podarati or “Burning of the King”. From Greece, precisely, the Carnival was taken to more distant places like Turkey, where it held for more than five centuries until it got banned. They celebrate it again since the mid-70s, and today the Carnival parties enjoy more popularity than ever in cities like Baklahorani or even Istanbul, where men and women wear traditional costumes, as well as fake beards and mustaches. Another way to enjoy the Carnival! Further east, if you look at the photography, are masks exclusive to Venetia? If you look closely there is something in the picture that does not fit. It was taken in the Venice of the Alps. Admittedly, Venice is the reference, not only regarding masked balls but also the city’s atmosphere. How many “Venices of the North” have you heard of? This one is located in the heart of the French Alps near the Swiss border. The town of Annecy (France) also has labyrinthine medieval streets, canals and bridges but the water over which the buildings sit is not salty. It is part of the largest lake in France and, according to several studies, it might be the cleanest water in the world. Carnival is the most internationally celebrated holiday and it started over 20 years ago. However, this is a celebration of a very Italian atmosphere but with a typically French taste. During these days, more than 350 masks, which are real works of art, stroll through the historic center, whose origins date back to 265 B.C., ending in a massive party. The best is the contrast of the warmth and colors of the celebration with the snowy peaks of the highest mountains in Europe behind. It is almost impossible to speak of Carnival without mentioning the vivid colors of the festival, but if you have to define the celebration that lives in the streets of Ivrea (Italy), just across the Alps, in just one color this would be… orange! However, this is not a conventional Carnival, since there are no masks or dances. On the contrary, what you will be able to witness here is an authentic Civil War. The world-famous Battle of the Oranges recalls the confrontation between the people who lived in the town against Napoleon’s troops the day after the death of the tyrant Raineri Bramante in 1808. An extraordinary citrus carnage with people in beautiful costumes. Besides, the aroma of fruit lingers in the streets acid for several days. But be careful so that the juice does not come into contact with your eyes! You don’t want to miss the main characters of the commemoration, the Mugnaia and the General. Another way to live out the Carnival! And remember, the most important thing about Carnival is having fun, putting aside the sense of the ridiculous, and enjoy shamelessly, no matter where. A good example is the Sambakarneval (Germany), full of political satire, where people dress up as public figures or football players. In Maastricht (Netherlands), you can hear the roar of cannons in the central square Vrijthof before the start of one of the most colorful Carnival parades in Europe. During the brief but intense 72 hours that the Basel (Switzerland) Carnival lasts, two parades with more than 10,000 masked participants take place. Will you be one of them this year? Have a good time! 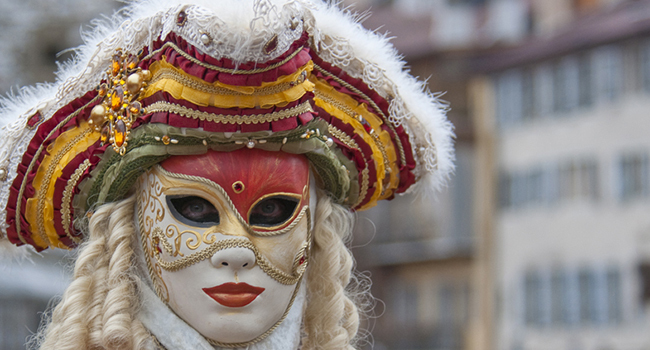 Do you want to know where the wildest, less known European Carnivals are happening?